The name of frame maker rob north will forever be linked with the works 750cc Triumph/BSA triples raced at the begining of the 70's by riders such as Mike Hailwood, Tony Jefferies, Gene Romero and John Cooper. 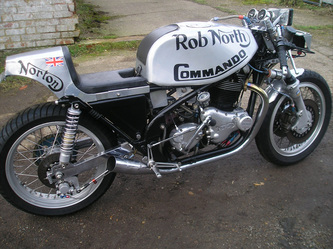 less well known as the adaptation of that famous frame produced in the mid 80's for twin-cylinder Norton Commando engine.The project was the brain child of Northampton Norton specialist Mick Hemmings, who had a batch of about ten made by Miles Engineering, the company which bought the North jigs and copyright. 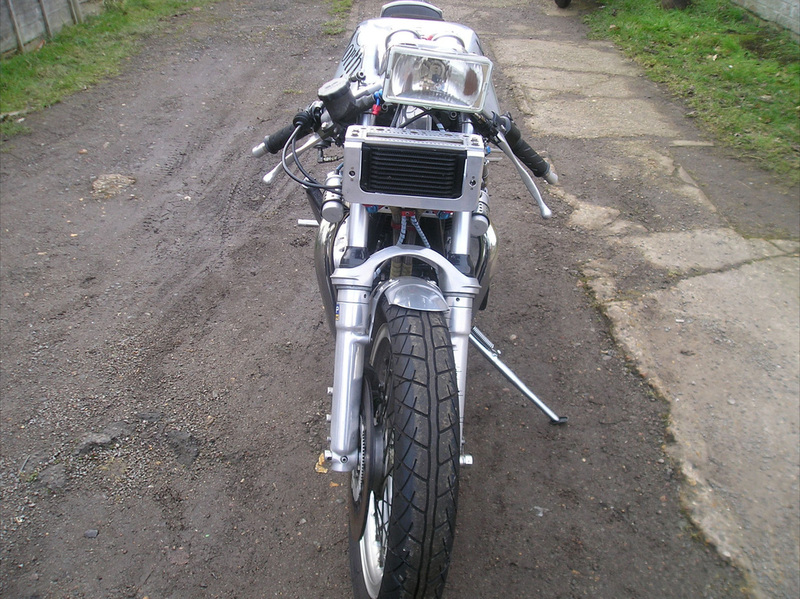 Mick fitted the first frame to a classic racer he campaigned himself. The second chasis, Pictured here, was bought by Howard Lally, who used it at the heart of a road going special. 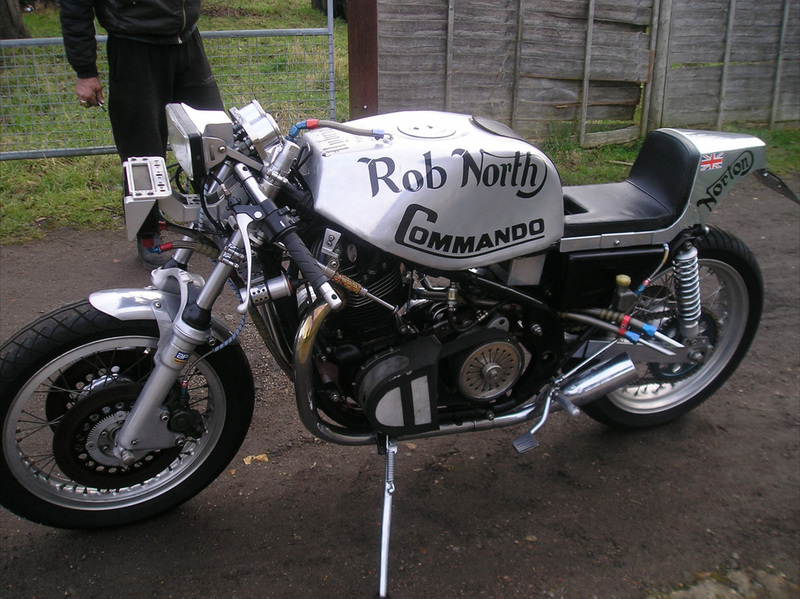 Howard was working as a Rolls Royce engine fitter when he splashed out about £700 for the North Commando T45 frame in 1985. "i saw the bike mick had built and had to have one," he said. 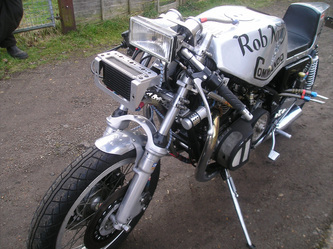 Café bikes have been Howard's business as well as pleasure since his launch 7 years ago of Hybrid Motorcycles, in Croxley Green, Watford, Hertfordshire(01923776660). He has built dozens of Britsh, Japanese and italian specials, But the North Commando remains a favourite he kepps tucked away in readiness for his own summer madness. 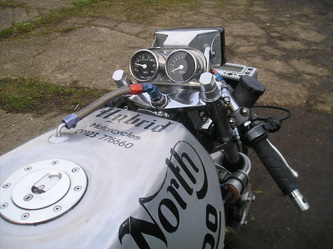 He says it handles far better than a standard Commando and the tuned big-bore 920cc motor delivers 135mph on the speedo. 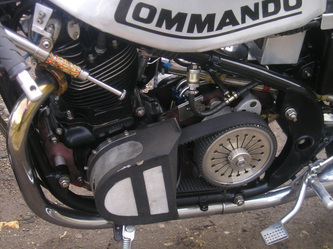 The drawback is the engine is no longer locked in its rubber-padded cell. 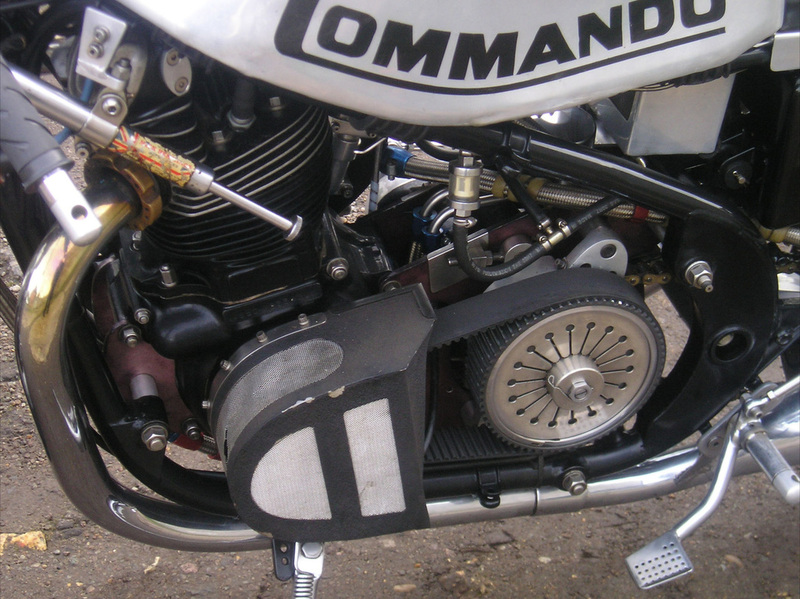 Without Isolastics to soak up the vibration, the ride can get a little rough at times. Howard, says:"it handles as well as a Japanese sports bike". You can keep up with anything on twisty back roads, but its not as comfortable as a standard Commando and its not a machine you would like to ride all day on a motorway. "I am running the engine with the balance factor of 75% and it does smooth out at about 90mph." 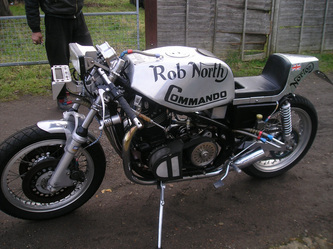 Howard spent 5 years and £10,000 building the North Commando. 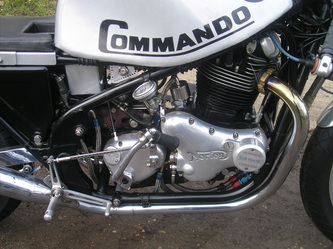 The spec includes box-section swinging arm, ten-pint central oil tank, Bartel Aluminium five-gallon petrol tank, Roadholder forks with Norvil sliders, Miles Engineering fork yokes, Fontana rear shocks, purpose made exhaust system and seat unit, Akront alloy wheel rims, rectangular car head-light and Norvil brakes.